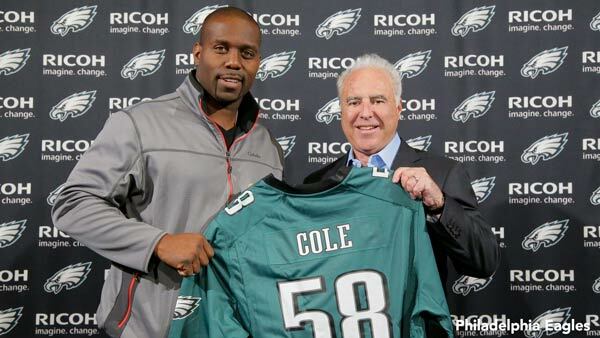 PHILADELPHIA (WPVI) -- Trent Cole, the two-time Pro Bowler and one of the Eagles' all-time leading pass rushers, signed a ceremonial contract before Monday night's game to officially retire in Philadelphia. Cole officially retired prior to the Eagle's game with the Oakland Raiders. He served as the game's honorary captain and was recognized in front of the home crowd during the first quarter break. Cole was selected by Philadelphia in the fifth round of the 2005 NFL Draft and went on to earn two trips to the Pro Bowl and a spot on the Associated Press All-Pro second team in 2009. Earlier in the day, Cole announced that he and his wife are expecting a baby girl this spring.